This is the first official freebie for February. This is nine specially designed valentines for you to print, cut and share. Your little ones can share them at school or day care. 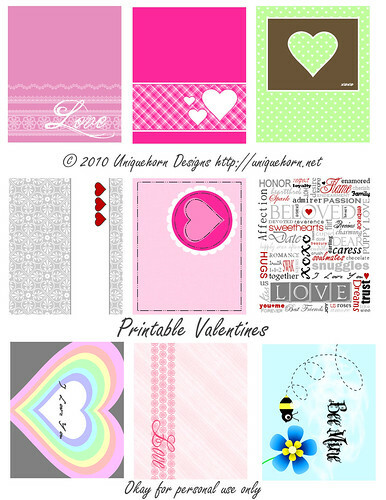 Or maybe you would like to give your friends or coworkers valentines this year. Don’t you remember how much fun that used to be! This month I will be posting freebies for February. I will have fun things like inspirational cards, stationary, candy bar wrappers, mommy calling cards and more. If you don’t want to miss anything make sure and subscribe to my blog! This image is for your personal use. Please do not claim them as your own creation or alter them. Thank You!